Chalk one up to my Pro Sara Dean for suggesting I meet up with Dustin Maher in Madison, Wisconsin. I was at first hesitant to reach out to him as his his tag line is “America’s Trainer to Moms” and I am not a Mom, however, I knew that moms sweat the same as me and figured I would be in good company, plus they would be use to it if all of a sudden I fell into a tantrum or started crying suddenly. I reached out to Dustin to introduce myself and tell him about my journey and he immediately responded with an invitation to his boot camp and this nice note ” I just checked out your website, really awesome. I always encourage people to live extraordinary lives and do things that others only dream of… You taking this trip fits right in line with my values”. With a proud bounce in my fingers I quickly replied and accepted the invitation. I arrived at the park nervous and excited to work out hard, it had been awhile since I worked out in a group setting like this. I immediately spied a large hill and my heart sunk, I had a feeling we were going to run that hill. I hate running. I despise running in fact. I don’t know if it is the pressure on my knees, the jiggle in all my jiggly bits or the fact that I am ALWAYS and forever the last person to finish. I fought my desire to flee and walked out to join the people warming up in the field. The group was very friendly and welcomed me with open arms. This group was so friendly in fact that no one made mention when a man (also not a Mom) showed up with his workout shorts with built in underwear on inside out. This was a very accepting group, which I was thankful for. We finished our warm up and did some partner exercises on the children’s play equipment to include park bench dips, arm rows on the parallel bars and some humiliating bar work that had us hanging off a high bar while trying, and I emphasize trying to pull our knees to our chest. I grabbed the bar and hung for a minute while my partner waited to “aid” me in my knee crunch. I continued to hang there. I truly think that if my life depended on me getting my knees to my chest while hanging like a monkey, with my hands burning from the pressure of gravity I would not be here to tell the story. My partner was very encouraging, and essentially lifted my legs to my chest for me while I sweated through the humiliation and the realization that I hadn’t shaved my legs in days. We transitioned from one humiliating moment to another when we started our cardio on the dreaded hill. Now it is important that I emphasize both Dustin and the others were very encouraging and were not the cause of any humiliation this is something I struggle with every time I work out in a group. Dustin had us running up the base of the hill, turning around and running backwards and then repeating until we were at the top of the hill. Once we were at the top of the hill we did sprints (my movement could have looked like fast walking with arms pumping furiously) combined with jump squats. This worked me and I quickly wondered what the elevation was, hoping that was part of the reason I couldn’t catch my breath. When everyone was done waiting for me to finish my reps we all gathered at the bottom of the hill to do planks and end in some relaxing yoga stretches. I left the workout proud of my accomplishments and even more proud of this journey, it is not easy to reach out to strangers, share with them your personal journey and then show up and do some hard work. A little personal pat on my own back, it looks less strange than giving myself a high five. In addition to training over 350 people at his 10 fitness locations around Madison, Dustin is also busy creating home workout DVDs (30 to date) and driving a pretty special program called the “Million Mom Movement” through his Fit Mom for Life program. His initial goal is to create 14,000 fitness support groups nationwide. These groups are comprised mostly of moms in communities throughout the county who connect with one another to train, support and motivate one another. If like me, you think 14, 000 is an odd number to begin with it will make sense when Dustin shares that this is the current number of McDonald’s in the USA and he feels that getting healthy should be as accessible as fast food is in our society. I think it is pretty cool that Dustin is working so diligently to provide Moms all over the US the opportunity to gather and work towards a common goal. I verbally asked Dustin my trainer questions and they are listed below “The dreaded hill picture”. The dreaded hill, objects are larger than they may appear! Q. Why did you become a strength coach/personal trainer? A. When he was in high school Dustin did resistance training, which changed his body and helped with his confidence level. He wanted to share his knowledge so he started training friends and family and as they were showing positive results he knew he wanted to continue to help others. 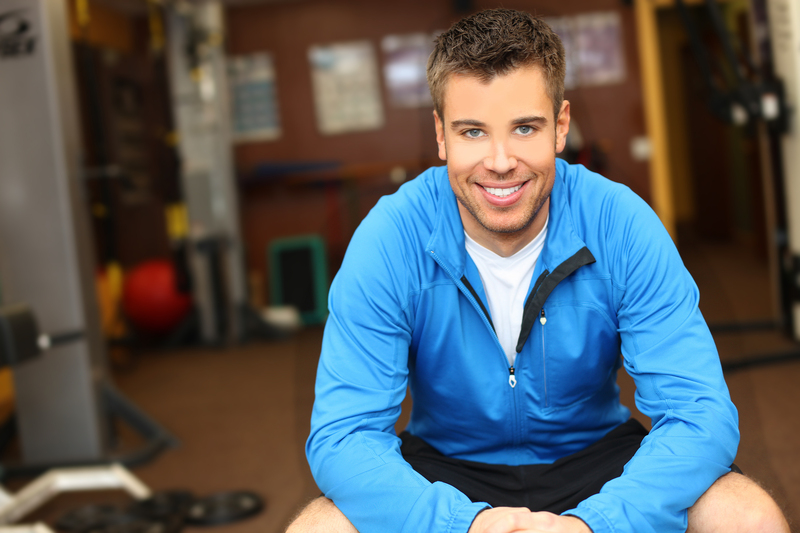 A. Dustin discusses with his clients their goals and analyzes where they are currently in their fitness, he believes that everyone benefits from and should strength train. If a client is new to exercise he will focus on stability and plyometric moves, which are a slower and more controlled way of exercising. As the client is ready he will gradually increase the reps, sets and the length of the exercise. When he has different levels working out together he will do timed workouts and if some finish early he has them do additional exercise until the class has all finished. A. Dustin runs stairs on a regular basis, plays basketball 1-2 times a week, plays Frisbee golf 5 times a week, volleyball, road bike, play tennis, competitive ping pong and ski hill jumping. A. As with most trainers it was difficult for Dustin to choose one as he has had many success stories in his career. The one that stood out in particular was his client Becky, who is the only client that Dustin trains 1:1 as she is dealing with specific health issues. Becky has lupus, arthritis, endometriosis and other autoimmune diseases that make it difficult for her to move her legs. When they began training Becky was a size 18, today she is down to a size 4. They have accomplished this all by focusing on upper body strength training and nutrition changes. A. Dustin likes Hip Hop & Rap as well as Eminem “Lose Yourself” because of its fast beat. A. When Dustin was in college he worked at a gym in Vale, CO. where Ryan and Trista Sutter, former contestants on The Bachelorette worked out. Ryan would always come in to the gym without a shirt. One day Dustin approached Ryan and asked him if he would be willing to take a shirtless picture to share with his friends back home. It turns out Ryan didn’t appreciate that and talked to his supervisor who had a discussion with him that it was very un-professional to ask. While Dustin agrees that it wasn’t the most appropriate question to ask he thought it was a good lesson in getting out of your comfort zone.